2019-03-07 20:50:49 Margotbean에 의해 마지막으로 편집 됨.
Maru is a villager who lives in The Mountains north of Pelican Town. She's one of the twelve characters available to marry. 1:30 PM Heading to bench south of the Saloon. 3:20 PM Sitting on bench south of the Saloon. 8:00 AM Leaves home and heads to Harvey's. 4:45 PM Leaves Harvey's and heads home. 2:00 PM Heads to bench east of the Community Center. 3:00 PM Sitting on bench east of the Community Center. 12:50 PM Stands in Entryway/Store (Home). 3:30 PM Sits down on bench north of graveyard. 6:30 PM Gets up from bench and walks home. 3:00 PM Reaches the bench to the right of the community center. 12:00 PM In the Lab with Demetrius. 2:00 PM Leaving lab goes to Pelican Town. 3:00 PM Sits on Bench located to the right of the Community Center. 6:00 PM Returns home to the Carpenter's Shop. 7:00 PM In room, working on her "Device". 6:30 PM Gets up from bench and walks home . 8:00 AM Walking to Carpenter's Shop. 2:00 PM Walking to Community Center. 3:00 PM Sits on bench to right of Community Center. 7:30 AM Leaves the farmhouse and heads to work at Harvey's Clinic. 9:00 AM Stands behind sales counter at the clinic. 2:00 PM Leaves sales counter and stands in waiting area looking at file folders. 4:40 PM Leaves work and heads home to the farm. You can give 마루 up to two gifts per week (plus one on 그녀의 생일), which will raise or lower 그녀의 너와의 우정. Gifts on 그녀의 생일 (여름 10) will have 8× effect and show a unique dialogue. You find Maru and Demetrius testing soil samples in their lab. Maru asks you to watch a beaker while she fetches more samples. 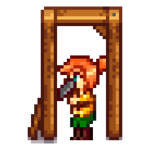 When she leaves, Demetrius tells you that Maru is a good kid and his 'special little girl', and he wouldn't want anything getting in the way of her bright future. When Maru returns, Demetrius says you've been talking about the soil samples. (Say nothing) (드미트리우스와는 우정 +10) Demetrius and Maru go back to work. "Actually, your dad was being weird." (드미트리우스와는 우정 -100) Maru asks Demetrius what you're talking about. Demetrius tells the truth and apologizes for his behavior. Enter the clinic when Maru is there. Maru is startled by your entry and drops a glass beaker she's holding. Worried about Harvey's response, she asks what she should do. "Just scoop it off the floor. He won't know the difference." (우정 -50) She says that of course Harvey will be able to tell the difference. When Harvey comes to investigate the noise, Maru tells him it was an accident and apologises. "Tell Harvey it was my fault." (우정 -20) When Harvey comes to investigate the noise, she tells Harvey that it was your fault. "Tell Harvey it was an accident." (우정 +50) When Harvey comes in to investigate the noise, she tells him it was an accident and apologises. If Maru blames you, Harvey is disappointed that she didn't take responsibility for her own actions and says the mistake will put them back in the red for a month. Maru is flustered and upset. If Maru says it was an accident and apologizes, Harvey thanks her for telling the truth and tells her not to worry about it. Maru thanks him for his patience, and Harvey says she's been a big help and he doesn't know what he'd do without her. He turns to you and asks if you're okay, since you're looking a bit pale; you turn away and emote a sweat drop. "A beautiful planet." (우정 +30) Maru responds, "It's amazing, isn't it?" "A cold, dark abyss." (우정 -30) Maru responds, "I guess you could see it like that... But it's still grand, isn't it?" Maru says her big project is finally done. She takes you into her private workshop to show you a robot she built to help her parents. She calls it MarILDA, short for Maru's Interactive Laboratory Device Alpha. She tells you she's been working on it for months, and has been waiting for you to come by before activating MarILDA. She activates the robot, who says "Greetings, Maru. No need to respond... I have already predicted what you will say." Demetrius comes in to see what you two are up to. He sees the robot and becomes frightened. Maru tells him not to be scared and that MarILDA is her latest invention. The robot greets him, but Demetrius is upset. "This is why you've locked yourself in your room the last few months? ...and I thought you were down here fooling around with <your name>..." Maru says she's been making this robot to help Demetrius and Robin when she's not living with them anymore. "I'm so impressed with your inventions." (우정 +50) Maru responds: "Thanks. That means a lot to me, <your name>. I know gadgets aren't really your kind of thing... but I do appreciate that you're showing interest in what I do. I wish I could return the favor somehow." "I'm disappointed... you should have made that robot your slave." (우정 -50) Maru responds: "What? After she said point-blank that she doesn't want to be a slave? How cold... You must have a good reason for saying that..."
"MarILDA's just a piece of machinery designed to act human." (우정 +50) Maru responds: "... You have a point, I did program her to act human... but her neural net is so complex, I can't be sure conciousness didn't emerge on its own. Furthermore, isn't it a little arrogant to assume that human-like consciousness is the only worthwhile vessel of existence? Computer brains are different than ours, but that doesn't mean we can disregard them." She thanks you for coming by and leaves. "I was just kidding. MarILDA deserves her freedom." (우정 +50) Maru responds: "I see. Well it wasn't a very funny joke." She thanks you for coming by and leaves. "I would've put her to work on the farm." (우정 -50) Maru responds: "That's horrible! What's gotten into you, <your name>? I'm just going to forget about this conversation... you aren't acting yourself." She thanks you for coming by and leaves. "So is your Dad okay with 'us' now?" (우정에 영향을 미치지 않습니다) Maru responds: "Heh... Yeah I guess he did kinda say that, didn't he? ...Um..."
(Just stare at Maru and say nothing) (우정에 영향을 미치지 않습니다) Maru responds: "... ..."
Once married, Maru will move into the farmhouse. Like other marriage candidates, she will add her own room to the right of the bedroom. She'll also set up a small area behind the farmhouse where she'll sometimes go to work on her gadgets. She will continue to work at the clinic and travel to town to work there on Tuesdays and Thursdays. On rainy mornings, Maru may offer you a gift she made in her workshop: Warp Totem: Farm, Quality Fertilizer, Refined Quartz, a Gate, or a Bomb. On rainy nights she may offer you dessert: Rice Pudding, Blueberry Tart, Cookies, or Chocolate Cake. On days when Maru stays indoors all day, she may offer you a Cherry Bomb, a Bomb, Fried Mushroom, or Crab Cakes, saying she found it in her "scrap pile". 마루 may randomly request an item at the "Help Wanted" board outside Pierre's General Store. The reward is 3x the item's base value and 150 Friendship points. 1.1: Added work area behind farmhouse if married. 1.3: Added group 10-heart event. Removed red color from plus sign on nursing hat. 이 문서는 2019년 3월 7일 (목) 20:50에 마지막으로 바뀌었습니다.